Remarkably resilient ink dries quickly and resists both fading and water. 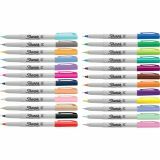 Endlessly versatile ultra-fine point is perfect for countless uses in the classroom, office, home, and beyond. 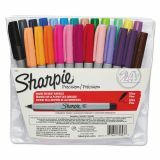 Rebate Available: School Supplies Rebate! 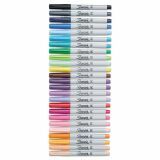 Sharpie Ultra Fine Tip Permanent Marker, Extra-Fine Needle Tip, Assorted Colors, 24/Set - Sharpie markers allow you to make permanent marks on most hard surface. The ultra-fine point provides a clean, neat writing line. Fade-resistant and water-resistant ink further extends multiple project uses. 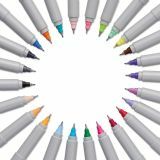 Quick-drying ink formula is nontoxic and alcohol-based. 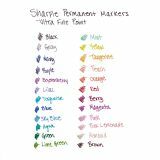 Colors include black, blue, red, green, yellow, purple, brown, orange, berry, lime, aqua, turquoise, magenta, tangerine, olive, navy, burgundy, marigold, plum, lilac, pink, sky, mint and peach.